So I have been banging this around in my head for a while now, should Etsy Sellers have a separate, standalone ecommerce shop? I have a pretty big internet empire and was SUPER excited when I realized that I could sell both my physical products (Glamorously Vintage) and my digital products (PaperlyPeople) on there. I have tried using membership sites in the past to sell products but have always run up against technical problems like users not being able to log in and not getting their products. These are more self run, self set up kinds of plugins instead of being big, behemoth ecommerce sites like Etsy and Shopify. So I have spent the last 6 months building my store on Etsy. I have almost 200 sales and am super happy with everything about them! But then I started hearing rumblings (there are always rumblings). 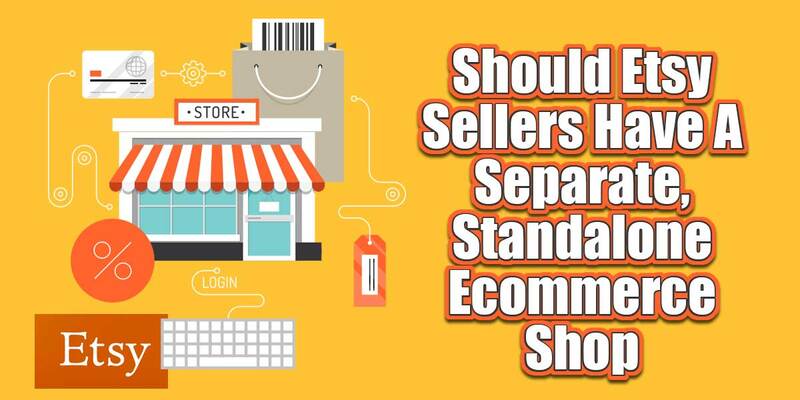 Should you have just an Etsy, or Ebay, or Amazon store, or should you have a separate, standalone store IN ADDITION to your store on these sites. Now I am not a stupid woman, I know that bad things happen. Sites get shut down, accounts get closed but I personally have never heard of someone operating a legitimate store get shut down anywhere over the years. No one on PayPal, or Amazon or anywhere. Hmmmm… but it got me thinking, should I have a standalone store that I control? But before we get to that, let’s talk a little bit about site that lets you post your listings with other listings. Ebay Artisan – The granddaddy of selling “stuff”. They just started an “Artisan Collective” where it seems that makers can set up shop. Amazon Handmade – This is Amazon’s answer to the handmade movement. I don’t know, I feel like their fees are really high (12%) but it would make sense for wholesale or if they were fulfilling your orders. Bonanza – A friend said she was thinking about using Bonanza so I checked it out. It seems like an okay site with a mismash of things. There are great things about putting your products on a site that is already established (like traffic, more about that later), but there is a huge problem too. Say I write a blog post like this, working my little fingers to the bone typing and I get someone to come visit it. YAY! Then they get all excited to use one of my marketing worksheets and I send them over to Esty to buy it. YAY! And when they are there they start thinking…hmmm… I wonder if there are any other cool worksheets here and off they go. BOO! I just did all the work to drive someone to my competitor’s products. But fair is fair, I get hits on my products from them too so it is about even-steven within the Etsy framework, but what about outside of it? Shopify (THE WINNER! This is what I chose for my standalone store) This is a super nice, self contained store that is hosted by Shopify. It is not done through your website, instead you pay a monthly fee to have your store, then you pay a credit card processing fee and any download charges. You can have a button on your site that pops up your store. About $29 a month for a basic store. Wix seems like a nice little ecommerce website builder. It is a little bigger, letting you do a website and store together. As I am not building a website, just an ecommerce store, this was not my favorite. About $39 a month for a basic store. Squarespace looks like a pretty robust website solution. It does have a website component, blog and store. About $26 per month for a basic store. WooCommerce is a plugin that makes a WordPress website an ecommerce site that I have heard great things about. Because I already had a fully functioning site that ranks well in Google so I didn’t want to mess around with doing a plugin and changing it over to a commerce site. If you are just starting a site this might be a good solution. Infusionsoft is my CRM (database) and they have ecommerce tools. I had thought about making product sales using this since it would integrate with my database, but then I was back to the problem of doing all the technical bits myself and that is something that I am really trying to avoid at this point. Architect (by Renae Christine) – If are a creative person and you need training on how to get your site set up I recommend Renae Christine of Rich Mom. Her stuff is always awesome! There are website solutions that “pull in” your Etsy items to a standalone website. While this seems like a perfect solution (you have your own site PLUS your Etsy products) it is actually not fixing some of the main Etsy problems. They still have to set up an Etsy login to buy, they can leave your cart and go to search for other items and you are not actually changing much because you are just pulling in your Etsy products, not making a new sales channel. So now let’s get down to the mechanics of having multiple sales stores. I have been uploading all of my products to Etsy first and then moving them over to the Shopify site now that I am getting things set up. Going forward I will put them on the Shopify site first so that Google will know that is my main selling area and then put them on Etsy second. It is not quite double the work since I can use the same graphics and basic description, although it would be better SEO-wise to have totally different titles and descriptions on the products. If you are selling one-of-a-kind items this gets hairier. You need to make sure you manage your inventory more closely, taking it out of your other ecommerce site when it sells. I am not sure I would want to do this much work, but if you are an organized, detail oriented kind of person this might not bother you! How Do You Run Sales? I am going to have EXACTLY the same pricing on both of my stores publicly! There are not going to be any shenanigans about “get it cheaper direct from me” or anything like that. One HUGE reason for this is integrity. I always do what I say and if I sold something on one site and was just hoping like hell they never saw the other site I wouldn’t be sleeping so well at night. That said, having the standalone site means that I can start collecting emails addresses and doing more “marketing” activities like offering coupon codes, etc. Etsy does not want you to contact your buyers for anything but product related issues so a bunch of true “internet marketing” tactics and sales funnels are off the table. Now here is where the rubber hits the road. The BEST thing about Etsy is that THEY drive the majority of traffic to your store. They do heavy duty advertising and have millions of buyers ready to pull out a credit card and buy something.In my Etsy store, out of 14,390 views 9,749 came from Etsy (so 67.7% of my views came directly from Etsy). That is a really big number. I would definitely not have the volume of sales that I have had without them driving buyers to my items. But I have big numbers too. I get about 30,000 views on my website pages per month and have rather large social media accounts who could drive some views too. BUT, if you are just starting out and have a brand new store you will not have that. You will have to generate all the traffic to your store by yourself. While that is not impossible, if you don’t have your own own internet empire at least started, you might want to take advantage of the Etsy traffic. When Should You Open Your Standalone Shop? So here are my thoughts about when you should open a standalone shop. They are not set in stone and if you have one or two, you might be ready even if you don’t have them all. You are willing to put in A LOT of work to set up a stand alone store. The getting it set up is just the tip of the iceberg. The hard work is getting traffic day-after-day to that site. You have social networks that are driving at least 10% of the traffic to your Etsy store right now. This will allow you to move that traffic over to your new store easily. You have a website that gets good traffic where you can put links to your items for sale. You have a successful podcast that you can use to promote your store. You have an offline store where you can promote your online store in person. You do a lot of craft shows where you hand out cards. You have at least 600 people on your email list who you can promote your new store items to. So, let’s really dish here. I have had a big website for years and have not been as dedicated to selling-selling things as I should have been. It seemed like there were always problems with whatever solution I tried to use, be it Infusionsoft or membership sites. I have now set up two third party sales channels who take care of all the techy bits (Etsy and Shopify) and I am super giddy like a schoolgirl. When you are scoping out and trying to check into solutions it can seem like that is all consuming, but make sure whatever solution you pick it fits your fabulous life going forward. If you love doing techy bits and tinkering, maybe do a plugin on your WordPress site. Love creating and doing no marketing, maybe just stick with Etsy and skip the separate site. But if you want to build your own empire AND are dedicated to doing whatever is necessary to make it happen, then GO FOR IT! Open up your own store and start selling.